Felix Rivendale, the Marquess of Wrenworth, is The Ideal Gentleman, a man all men want to be and all women want to possess. Felix knows very well his golden image is a hoax. But no one else suspects the truth, until Miss Louisa Cantwell comes along. From their first meeting, Louisa has mistrusted his outward perfection. Yet even she could not have imagined that The Ideal Gentleman would propose - to make her his mistress. She cannot ignore the pleasure his touch ignites. Nor can she deny the pull Lord Wrenworth exerts upon her. Dare she get any closer to a man full of dark secrets, any one of which could devastate her? 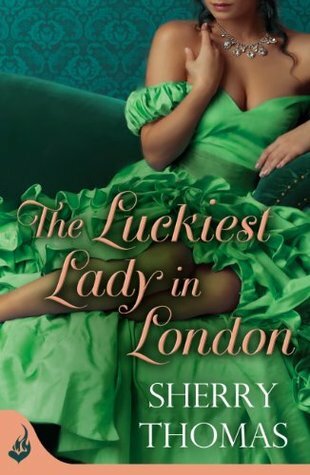 The Luckiest Lady in London is the first in a London Trilogy by Sherry Thomas. This book was my first read of this author but it will not be my last. It is set in Victorian England and mainly features Louisa and Felix, any other character is on the periphery of this - their story. I loved Louisa, a young woman with a conscience, she must find a suitable husband for herself who will be able to care for her and financially help out with her mother and sisters, one of whom has epilepsy. While Louisa feels she must make a good marriage, and sets about with a list of the things she must do, she is not prepared to sacrifice herself and her happiness. She has a very good sense of herself and throughly enjoyed her own sexuality. She is also very intelligent and loves books. Felix has had a tough childhood, his mother did not want to marry his father but was forced into it. From that point on she set out to make her husband's and son's lives miserable. She succeeded, Felix has put a whole personna around himself as The Ideal Gentleman, he is determined never to feel in need or powerless or vulnerable for anyone. There is a natural attraction between Felix and Louise and before long Felix is present wherever Louisa is during the London season. He finds a very able, sparring partner in Louisa, she is no retiring, blushing young lady. She speaks her mind. When he propositions her with the offer of her becoming his mistress and being financially safe, she has much to say on the very idea of it. Before long Felix is thinking marriage and surprises Louisa with a proposal. It is obvious they are going to live happily ever after, but the push/pull tension of their relationship makes the reading of this novel highly entertaining. Felix finds himself all at sixes and sevens and in a place he never envisioned. For Louisa when she discovers something that deeply disappoints her and makes her question the integrity of Felix, she knows she is not prepared to be treated as a 'thing' or to see other people treated in that way either. Sherry Thomas' writing is impeccable, so much of the dialogue rings with risqué double entrendre. Very hot without being graphic. The characters are delightful and the setting of the large country house beautiful. I certainly look forward to more writing from this talented author. You sold me with "very hot without being graphic" and of course the impeccable writing ... must make time for this one! Yes Bobbi Dumas who writes in Kirkus Reviews sold me on this one. Louisa was very good at sharing her fantasies with Felix! I will certainly be trying a few more of hers some time. Now ... back to Mary Balogh - that's who I am reading at present.